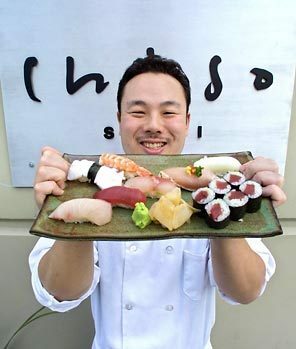 Taichi Kitamura, the sushi chef who opened Fremont’s Chiso restaurant in 2001 and later thrilled omakase fans with his intimate upstairs addition Chiso Kappo, expects to be slicing raw fish and dazzling diners with his kitchen skills at a new restaurant on Eastlake this spring. Chiso will stay in business under new management, with many of the familiar faces in the kitchen and dining room. Taichi plans to remain upstairs doing his one-man voodoo at Kappo pending the sale of that secondary space. [Tapas bar, anyone? Joseba?] “It’s safe to say I’ll probably be up here till the end of February,” he told me today. After that, he’s hoping to take a much needed vacation before the debut of his new Kappo in the Ruby condo complex, also home to Ravish — the “naughty little sister” of Ravishing Radish Catering. Unlike the upstairs/downstairs arrangement in Fremont, Taichi’s new street-level restaurant on Eastlake will seat 50. Its design is still in the planning stages, he says. “I want to stick with the minimalist modern Japanese design, using nice wood and earth tones, but I’ll leave that up to my wife,” who was schooled in interior design. “I want to create a space where people can come in for omakase, like I do upstairs here at Kappo, but at the same time have a large sushi menu with a la carte sushi available.” At 2000 square-feet, “It’s a size I’m comfortable running.” A 12-seat private dining room is under consideration. Former kitchen manager Hiro Kirita will take the helm at Chiso beginning next week, and Steve Tamura, Taichi’s business-partner and Chiso’s front-man “will be sticking around for a couple weeks after the transition” (he’ll oversee the dining room at the new Kappo). “I have not been working downstairs for two and a half years,” says Taichi, who expects a seamless transition — one that downstairs diners may not even notice.